1Research Laboratory of Physics, Harvard University, Cambridge, Massachusetts. The general theory developed in Part I is used to prove three equivalence theorems about optical systems of the type under discussion. We prove that any optical system which contains only retardation plates and rotators is optically equivalent to a system containing only two plates—one a retardation plate, and the other a rotator. We then prove an exactly analogous theorem for systems containing only partial polarizers and rotators. 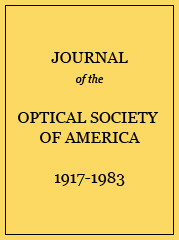 Finally, it is proved that the most general optical system which contains any number of all three types of plates is optically equivalent to a system containing at most four plates—two retardation plates, one partial polarizer, and one rotator.